Zoe Kleinman tries out software that uses a phone's camera to tell you where the nearest London Underground station is. Acrossair processes GPS data and information from an iPhone's accelerometer - the component that measures the amount that a device is tilted. It analyses the camera image then tells you which direction to go in to reach the nearest stations. 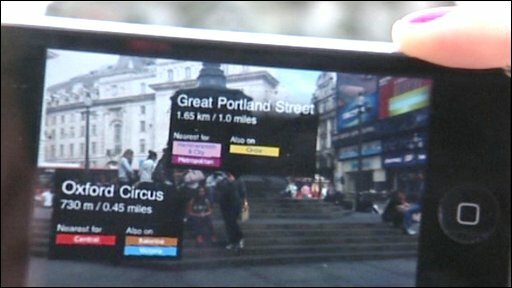 Augmented reality systems such as this are in their early days but are expected to become increasingly common installations on smartphones.